By now almost everyone knows (I hope!) that Los Angeles has a subway. 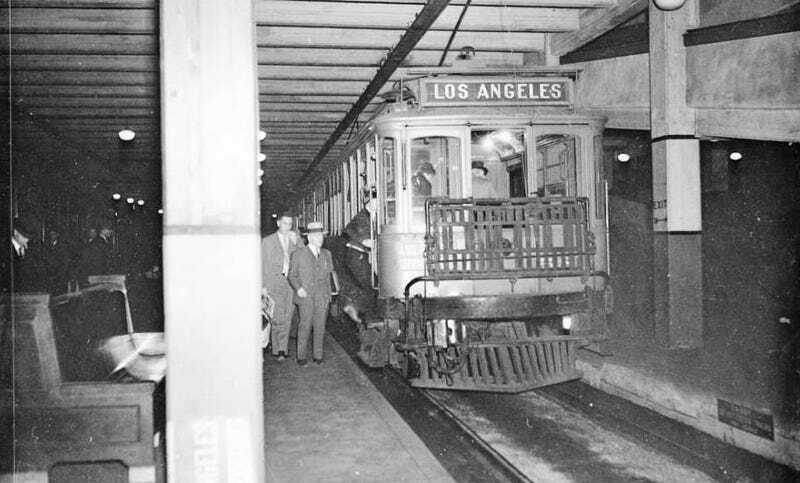 But did you know that this is not the first subway that LA has ever had? Ninety years ago today, the Pacific Electric Subway opened in Los Angeles, connecting the city’s growing transit network with a 1.9-mile tunnel. The Pacific Electric system—nicknamed the “Red Cars”—was once the largest interurban railway in the world, with over 1,000 miles of track at its height in the early 1920s. But many of its trains and trolleys were traveling along streets which were already becoming crowded with automobiles. The subway was proposed to help move passengers more efficiently through high-traffic areas but also as a way to avoid LA’s many hilly neighborhoods. The tunnel was approved by a bond measure with the hopes that future rail development would be placed underground as well. On November 25, 1925, the subway tunnel opened to great fanfare. Passengers found they could shave a great deal of time off their trips to popular destinations like Glendale and Hollywood and the subway became a hit. At one point during the 1940s over 65,000 riders per day were shuffling down into the depths of Los Angeles to board the trains. The subway terminated in the creatively named Subway Terminal Building, which still stands today in the heart of LA’s changing downtown. While the building has been turned into luxury lofts, the subway station below it remains almost completely untouched. It’s condemned now—do not call the building and try to arrange a visit—but a few years ago I got special permission to go in there. Here are some of my photos compared to historical images from the Metro Library Archive. In many parts of the station you could still see the decorative ceiling, pillars, and floor completely intact. The walkways to the platforms were still there, too. This guy wasn’t around anymore, unfortunately. OR MAYBE HE WAS. The remaining signage was probably the coolest part. You could almost navigate the station using the existing wayfinding. Pretty crazy, right? After being used as a fallout shelter, the tunnel was sealed here in the 1960s. Then the Bonaventure Hotel was built in the 1970s, occupying the portion of the tunnel just on the other side of that wall. The rest of the tunnel became known as a famous spot for graffiti artists until it, too, was sealed. However, anyone can still visit the other end of the subway. This is at the Belmont Station apartments, at the intersection of Beverly and 2nd, where, if you’re a resident, you can walk your dog along an Astroturfed section of the former tracks. Otherwise you can stand here and take a photo. The tunnel itself as well as the former substation are still completely intact. If you look at this maps of the Pacific Electric Subway plotted on a contemporary map (here’s a cool Google Maps version), you’ll see how the tunnel traveled beneath Bunker Hill and emerged on the other side to connect with other lines. But depending on which legend you like to believe, LA’s subway, and its entire Red Car network, was a failure in the end. The last train ran through this tunnel in 1955 and it wasn’t until 35 years later that the city would have a rail system again. Someday I’d love to see the old subway station preserved as a museum chronicling LA’s long and storied transit history. But the truth is that you can experience the legacy of LA’s first subway today. On January 30, 1993, LA celebrated the opening of a new subway line, which also happened to travel to Hollywood. It’s named the Red Line, as a nod to those Red Cars, and you can board it just a block from where passengers first traveled below LA’s streets.